Juggling! | Planet Geek test site. After college, I hooked up with the wonderful folk at the Philadelphia Jugglers Club, where we juggled (and unicycled, and played music, and and and) every week on the steps of the art museum. I worked my way up from balls to rings to clubs to torches. I learned to ride the unicycle, and owned 3 (a normal Schwinn, a medium sized ‘home built’, and a Schwinn 6′ giraffe (which, apparently, I still own – the fellow who has it contacted me recently and said “Hey, do you ever want your unicycles back?” – I haven’t seen him in 15 years). I also got into ‘magic’ related activities, like learning to do linking rings and cigar box juggling. After a while I let things trail off, as other bits of life took precedence, but I still enjoyed picking up my clubs (I still have the set I bought in college, now 25 years old and looking the worse for wear), and passing with whomever was around. About a year ago, I was able to get a new crate of clubs via my friend Mort, and have slowly been getting back into the swing of things. This weekend at our camping event was the first time I felt like I was ‘back in the swing’ with my passing, as it were. 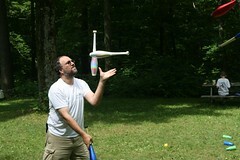 The picture above is one of the few of me juggling – I have none from the Philadelphia days, and over the years I know people have snapped a shot or two, but this pic was taken in the middle of a 7 club passing run with a fellow I’d passed with before on occasion. Jim and I worked for about 15 minutes to get ‘back into the groove’, and ended up with a comfortable 20 or 25 throw passing session that felt WONDERFUL. I hope to find a group I can juggle with regularly out near us – it’s good for me mentally, and a mighty good workout on the arms.